The Darien Book Aid Plan is a Non-Profit Organiza- tion based in Darien, Connec- ticut. Their goal is to “build a foundation of peace, understanding, and friendship through the free distribution of books.” The Darien Book Aid Plan is an all volunteer organization and was founded by a group of women in 1949 to help alleviate the book shortage in war ravaged Europe. The Darien Book Aid Plan relies on private donations. 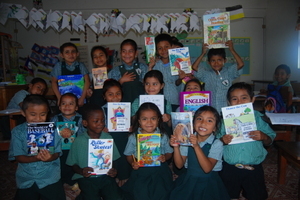 They receive book donations from individuals, schools, libraries, and publishers. Since its beginning, Darien Book Aid has shipped millions of books, both domestic and abroad, to more than 180 countries all over the world. Today about 60% of the shipments fulfill specific requests from Peace Corps Volunteers. As part of my Primary Project, working at St. Benedict R.C. School, I hope to build up our classroom libraries, as well as the school library, providing access to age appropriate reading materials. Last week, St. Benedict R.C. school received a 30 lbs box of free used books from the Darien Book Aid Plan. The teachers and students were so excited. The books are already being put to use. Thank you Darien Book Aid Plan. To learn about the Darien Book Aid Plan and find out how you can help click here.